Maruti Suzuki launched its first-ever premium hatchback, the Baleno, in the Indian market, which swiftly gained popularity. Before the launch of the Baleno, the Maruti Swift used to be the most expensive hatchback from the brand. Here is an old-generation Maruti Swift owner who has upgraded his Swift to look like a Baleno with the help of some modifications. As seen in the video, the original condition of the Swift was quite bad. There are multiple scratches on the vehicle and, reportedly, it is also severely rusted. The video says that the suspension system, steering system and many other mechanical parts of the vehicle needed a complete overhaul. The video shows the work in progress and the vehicle’s transformation into a Maruti Baleno look alike. The modder has mentioned that everything in the vehicle has been reworked including the AC system, suspension and the steering system. The new vehicle looks quite similar to the Baleno, especially the front end. The video shows that the final product gets a modified front that houses the grille of the Maruti Baleno. It also gets a new dual paint scheme. The red base gets a white roof, door handles and ORVMs, giving it a contrasting effect. The car also gets faux hood scoops that give it a muscular look. At the rear, the Swift remains stock. New badging have also been placed at the front and rear that gives a new look to the original car. Maruti Baleno and the older-generation Swift have similar headlamps. The Baleno gets sleeker lamps while the Swift offered a squarish design. The similar headlamps and the grille are enough for enthusiasts to give it a second look. 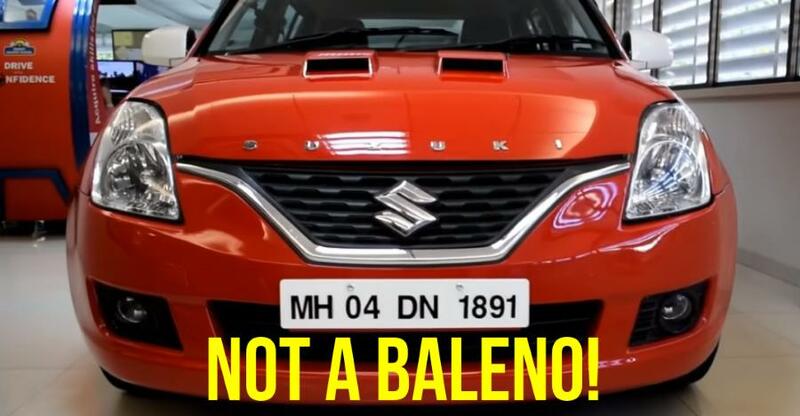 The modified car’s front-end can make many think that it is a Baleno. Even though the all-new Swift and Baleno share the same platform, the older generation Swift was based on a different platform. However, both of them are powered by the same engines that are tuned in a different way. They both get a 1.2-litre petrol engine that generates 83.1 Bhp in the Baleno and 81.8 Bhp in the Swift. The Baleno produces slightly more torque at 115 while the Swift produces 113 Nm. The 1.3-litre diesel engine produces a similar 74 Bhp and 190 Nm in both the hatchbacks. The Baleno offers CVT automatic transmission with the petrol variant while there was no automatic option in the last-generation Swift. However, the all-new Swift offers AMT automatic transmission with both petrol and diesel engine options. The Baleno starts at a price of Rs. 5.35 lakhs and the new-generation Maruti Suzuki Swift starts at Rs. 4.99 lakhs, both prices ex-showroom, Delhi.